Fearing a coming crackdown on immigrants, Los Angeles City Council members Joe Buscaino and Curren Price vowed to stop punishing vending as a crime and to begin setting up a regulated system. In January, the council voted to draft an ordinance decriminalizing vending. Previously, selling food or goods on the sidewalk could lead to misdemeanor charges in Los Angeles. City staffers say it could take months for Los Angeles to work out all of the details and begin handing out permits to vendors. In the meantime, vendors who ply their trade on city sidewalks still could be cited and fined for violating the municipal code, but they would not face criminal convictions. Dave Michaelson, a chief assistant city attorney, said Wednesday that a first-offense citation would result in a $250 fee, and a second offense would have a $500 fee. Future violations would result in $1,000 fees. It is unlikely that more than one citation could be issued within the same day, Michaelson said. Though lesser citations have been more common, city prosecutors filed misdemeanor charges for sidewalk vending in more than two dozen cases between October 2015 and October 2016, according to the city attorney’s office. At the February 7th hearing on the San Fernando Mission Blvd/Woodley project, a compromise was reached in principle. Harridge Development has two weeks to submit a new design. Everyone will then have two weeks after that to submit comments, suggestions, and objections to the city planner. (the differential is probably to provide incentive to build condos, which cost more and don’t provide a steady stream of revenue). Put in a median on Woodley (must be approved by LADOT). Prevents more dangerous left turns and prevents northbound residents from entering that way, so number of cars are decreased). Change “very low income” units to “moderate low income”. Keep the record open for comments for 2 weeks after submitted. Harridge picked the option for condos, which was one of the main points heard from neighbors because of “pride of ownership” – if you own a property you tend to take better care of it. At around February 22 we should have the new design to review, though this might slip by a couple of days. 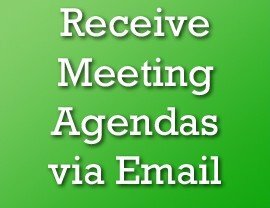 We are working on setting up a meeting after the new documents are available, and we will notify you. Starting this month, the LA Department of Transportation will begin accepting applications for the Speed Hump Program. The popular program was halted in 2009 amid the city’s recession. In June 2016, the Budget and Finance Committee restored the program and approved the allocation of $540,000 to begin speed hump construction. Community plans direct what can and cannot be built in neighborhoods and allow residents to weigh in on what they want their community to look like. Currently, the majority of the city’s community plans have not been updated in more than 15 years. Southern California Gas Co. settle with the South Coast Air Quality Management District over the four-month Aliso Canyon leak. Southern California Gas Co. reached an $8.5 million settlement Wednesday to resolve a lawsuit filed against the utility by the South Coast Air Quality Management District over the four-month leak at the Aliso Canyon natural gas storage facility in Porter Ranch. The settlement of the lawsuit, which was filed in January 2016, includes funding for a AQMD-sponsored health study on the impacts of the leak. “Consistent with the commitment we made last year, SoCalGas has agreed to fund AQMD’s health study. We are pleased to have worked with AQMD to settle this and other matters,” according to a statement from the utility. This week, I spoke during the Department of Conservation, Division of Oil, Gas, and Geothermal Resources (DOGGR) Public Meeting on the Aliso Canyon Storage Facility. The Aliso Canyon Gas Leak was the largest in US history. With over 15,000 residents relocated, 2 schools closed, Holleigh Bernson park closed due to oily residue, dozens of local businesses affected, thousands of homes professionally cleaned from oily residue, and thousands of complaints of bloody noses, headaches, rashes and nausea the Porter Ranch, Chatsworth, Northridge, Granada Hills and West Hills communities were directly impacted by this disaster. Over a year later, we are no closer to learning the root cause of the blow out than we were on day one. This is a community that has suffered. This is a community that has not been adequately protected by the regulatory community. This is a community that is entitled to the safe and healthy enjoyment of their homes and their neighborhood. This is a community that has fought in opposition when the Gas Company and, in fact, the State decried falsely, that there would be brown outs and blackouts this past summer due to the lack of ability to draw down and to reinject natural gas at Aliso Canyon. Currently, SoCalGas has been allowed to draw down, despite the fact that after a year, the root cause of the blow out is still unknown. I cannot fathom how any responsible regulatory entity could allow this facility to resume its functions without knowing if they were again putting the host community at risk with their lack of knowledge and understanding of the root cause of this failure. I implore DOGGR to do right by this community and not allow draw down or reinjection until it can be known if it’s even possible for this facility to operate safely. Click below to view my KTLA interview. The Los Angeles Office of Finance is reminding entrepreneurs, business owners, and individuals that conduct business activities within the City of Los Angeles that it’s time to submit their Business Tax Renewal Form. The filing period ends February 28, 2017, and businesses are encouraged to avoid lines or delays by filing early online or at one of three office locations (listed below). The Office of Finance has a newly updated website that makes it easier than ever to submit the form online from any kind of device: finance.lacity.org. All registered businesses must submit a Business Tax Renewal Form even if they don’t owe taxes. You may qualify for an exemption, especially if you have a new or small business. Businesses that qualify for the Small Business Exemption are also eligible to receive assistance in completing their tax renewal forms until February 10, 2017. For more information, visit finance.lacity.org or call 844-663-4411. The free L.A. City Skill for Alexa has been updated so Angelenos with an Amazon Echo, Amazon Dot, or any other Alexa-enabled device can “Ask L.A. City” about City Council, Council Committee, and featured events occurring within the City. Many more features and information will be coming in the near future. Each year, the City of Los Angeles receives federal grant funds to assist businesses to create jobs; provide job training for adults and youth; improve neighborhoods through projects that eliminate slum and blight; provide affordable housing, domestic violence shelters, and fair housing services. These grant funds are limited and need to be prioritized and targeted in a way that will provide the most benefit to the most people. Once our needs and goals are prioritized, we will submit them to the federal government through the Consolidated Plan. The annual Action Plan, beginning April 1, 2017, will cover the fifth year of the City’s five-year, transit-oriented Housing and Community Development Consolidated Plan. Federal grant funds can be seen in action in your neighborhood through federally-funded community centers, after-school programs, training and assistance for small businesses, services for the homeless, affordable housing, domestic violence shelters and many other programs and projects. WITH SO MUCH NEED IN THE CITY, HOW WILL THESE FUNDS BE PRIORITIZED? In order to make the most use of the limited funds the City receives, our strategy is to take advantage of the additional funds the City will receive for public transportation. For example, we may want to invest our federal funds on projects that provide affordable housing and job creation near transit corridors, such as the Expo Line, the Gold Line, the Orange Line, the Vermont corridor, and in areas of need in the city. We want to create more livable and healthy communities where services and programs are available and accessible; where people can walk, bike, or take public transportation to work and school. Comments will be accepted till February 13, 2017. Access Request Program: The program makes repairs requested by/for people with a mobility disability who encounter physical barriers such as broken sidewalks, missing/broken curb ramps or other barriers in the public right of way. Rebate Program: A limited-time rebate for eligible property owners willing to pay for their own sidewalk repairs. Owners can receive up to $2,000 for a residential lot or $4,000 for a commercial lot. The general public can report a sidewalk in need of repair. 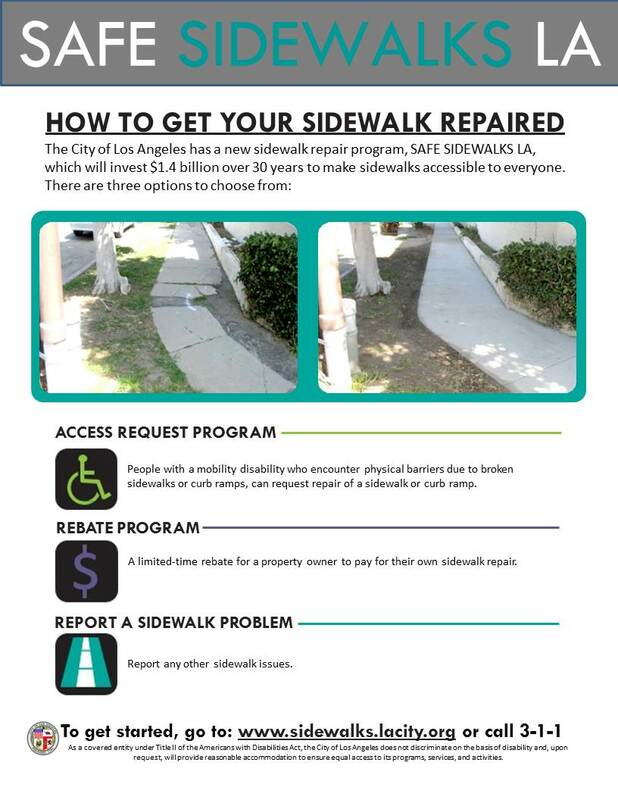 To submit a sidewalk request or for more information on Safe Sidewalks LA, go to: www.sidewalks.lacity.org or call 311. The Los Angeles City Council just approved the purchase of 42 acres of property at the center of plans to revitalize the Los Angeles River. Known as the G2 parcel, the property is the final remnant of the 250-acre Taylor Yard owned by Union Pacific Railroad. Taylor Yard is on the east bank of the LA River, north of Downtown in the Cypress Park neighborhood. The surrounding parcels at Taylor Yard have already been developed into Rio de Los Angeles State Park, the Sonia Sotomayor Learning Academies and the Taylor Yard Transit Village. The G2 parcel will connect Rio de Los Angeles State Park with the Bowtie parcel, another State Park site — opening up more than one mile of direct riverfront access. Led by Mayor Garcetti, LA secured $25 million in state funding toward the city’s purchase and development of the G2 parcel. With today’s Council vote, the City will move forward to allocate nearly $60 million. The G2 parcel is prioritized in both the City’s Los Angeles River Revitalization Master Plan and the U.S. Army Corps of Engineers’ Los Angeles River Ecosystem Restoration project, which was approved by the U.S. Congress in 2016. Because of its size and location along a soft-bottom stretch of the river, G2 can help restore habitat, while also providing expansive new public views into Downtown and to the iconic Griffith Observatory and Hollywood Sign landmarks. This week, I joined Supervisor Kathryn Barger as we submitted motions to both the County and the City to support California State Senate Bill 146 by State Senator Henry Stern. Stern’s bill extends the prohibition of gas injection into the Aliso Canyon gas storage facility until officials have identified the root cause of the leak and released the findings to the public. SB 146 would also change the deadline for the Public Utilities Commission to open proceedings to determine the feasibility of minimizing or eliminating the use of Aliso Canyon to December 31, 2017 from July 1, 2017. It is unacceptable that as we approach the one-year anniversary of the closure of the Aliso Canyon leak, we still don’t know the root cause of the largest leak in US history. With over 15,000 residents relocated, two schools closed, and dozens of businesses affected, it is simply irresponsible to reopen without a completed investigation. If you grounded a plane because of engine problems, you would never allow that plane to fly unless you were certain of the cause of the failure and able to prevent it. Click here for more information and to view the full motions. Gov. Jerry Brown Monday declared a state of emergency for Los Angeles and Orange counties for the powerful winter storms that have caused tens of millions of dollars in damage. Brown issued emergency proclamations “to secure funding to help communities respond to and recover from” the storms, which “have caused flooding, mudslides, erosion, debris flow and damage to roads and highways,” according to a statement from Brown’s office. The State Department of Gas and Geothermal Resources (DOGGR) and the California Public Utilities Commission (PUC) are about to give the Gas Company the green light to resume operation of the Aliso Canyon Gas Facility before the cause of the gas well blowout has been determined. They will be holding a public meeting on February 1 and 2 in Woodland Hills on this matter. The meetings will be from 5:30 pm to 9:00 pm each evening. THIS IS YOUR CHANCE TO MAKE A DIFFERENCE. NOW IS THE TIME TO SHOW UP AND SPEAK UP. The meeting is being held as required by Senator Pavley’s Senate Bill 380 to provide an opportunity for comment on the findings of the comprehensive gas storage well safety review conducted at the Aliso Canyon Storage Facility and on the Division’s proposed minimum and maximum pressure limits for the Aliso Canyon Storage Facility. The CPUC will be on hand to discuss energy reliability and how to participate in a future proceeding to determine the feasibility of minimizing or eliminating the use of the Aliso Canyon Storage Facility. The Aliso Canyon Storage Facility comprehensive gas storage well safety review and related documents and information are available on the Division’s website at: http://www.conservation.ca.gov/dog/AlisoCanyon/Pages/Well-Detail.aspx. The proposed minimum and maximum pressure for the Aliso Canyon Storage Facility and related documents and information are available on the Division’s website at: http://www.conservation.ca.gov/dog/Pages/AlisoCanyon.aspx. Information about the range of working gas necessary to ensure safety and reliability for the region will be available on CPUC’s website at: http://www.cpuc.ca.gov/aliso/. The program, which Councilmembers Paul Koretz and José Huizar introduced as a motion in 2010 and worked on during Huizar’s time as Chair of the Energy & Environment committee, will also ensure fair pricing, improve service and working conditions and help us meet our zero waste goals for Los Angeles. Councilmember Nury Martinez helped usher this long-working policy as an advocate and the recently appointed chair of the E&E committee. While 70% of L.A.’s waste comes from commercial and apartment buildings, this new program aims to reduce landfill disposal by 1 million tons per year by 2025 and reduce waste by 65% in all 11 of the City’s new service zones! The program will also decrease food waste and provide all Angelenos with Blue Bin access, no matter where they live or work. Decrease and recycling of food waste, and increase in food rescue.